Murder by Gaslight: The Stillwell Murder. Amos and Fannie Stillwell returned home from a party at a neighbor’s house on December 29, 1889. 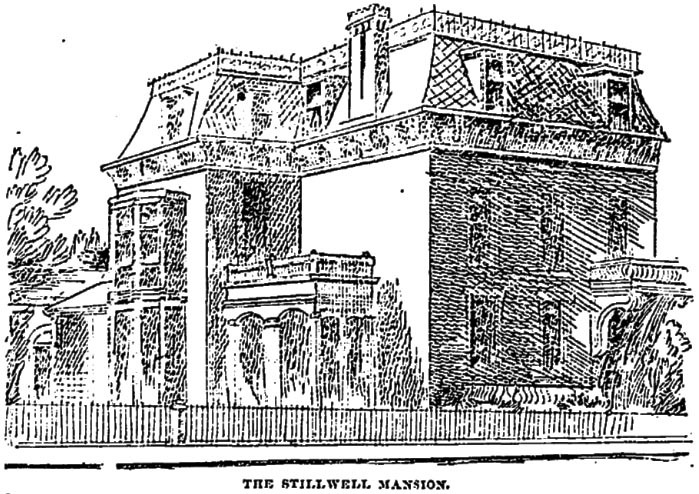 It was a small gathering of Hannibal, Missouri’s high society and the Stillwells were among the wealthiest and most prominent guests. Mr. Stillwell grew tired at around 11:30; the couple left the party and took the short walk back to their house. They had left their three young children in the care of two servant girls. Mrs. Stillwell dismissed the servants and took the children upstairs with her. The Stillwells slept in separate beds, and that night Mrs. Stillwell shared her bed with the children. Another daughter, 14-year-old Mollie normally slept in the room next to her parents, but that night she was away visiting friends. She could see a man standing with his back to her, and a moment later she heard a “whirring” sound as if something was thrown violently through the air. Then she heard someone running down the stairs. She rushed to her husband’s bed and found that he had been murdered, he had a terrible gash in his head and he was lying in a pool of blood. From this point on Mrs. Stillwell’s memory of events became confused. She had taken the screaming children back to the servants and run outside in her nightgown to the home of her neighbors, the Leagues. Mr. League heard her story and hurriedly summoned Drs. Hearne, Allen, and Gleason who lived nearby. Back in the bedroom, Mrs. Stillwell had fainted and remained unconscious as the doctors examined her husband’s body. He had been struck with an axe, leaving a wound so deep that it severed both his jugular vein and his carotid artery. Realizing that nothing could be done for Mr. Stillwell, Dr. Hearne turned his attention to Mrs. Stillwell. He was her advising physician and was able to bring her back to consciousness. The police investigated the crime scene and determined that the killer ran through the back door of the house through the yard and into an alley. As he ran, he had dropped a $5 bill which was found in the alley. About twenty feet further, they found four more $5 bills and a little further on, the empty pocketbook. The murder weapon, an old double-edged axe, was also found in the alley. The police believed that the intruder’s original intent was burglary, but he had awakened Mr. Stillwell and killed him to escape unidentified. The murder of a prominent citizen caused great excitement in Hannibal and everyone was anxious to get the killer behind bars. The Pinkerton Detective Agency was called in to assist the police and Richard Stillwell, Amos’s son from his first marriage, offered a $1,000 reward for the capture of the killer, which added amateur detectives to the case. The family, including Richard Stillwell, firmly believed that the killer was a burglar interrupted while robbing the house, but many in Hannibal thought Amos was killed by someone closer to home. 65-year-old Amos Stillwell had been the owner of a pork packing business and was one of the wealthiest men in Hannibal. After the death of his first wife more than twenty years earlier, he met Fannie Anderson on a visit to relatives in Indiana. Though she was still in her teens, Amos fell madly in love with Fannie and proposed marriage. Fanny did not get along with her stepmother and had been contemplating entering a convent. She decided that being the wife of a rich widower was preferable to a life in the church and she accepted his offer. The Stillwells appeared to have a happy marriage, but Amos was growing old and Fanny, 30 years younger, was still in her prime. Amos could be a hard man to live with, he managed the household as he did his business and abhorred waste and needless expense. He was a vegetarian and a health enthusiast and forced Fannie to sleep in a heavy cotton nightgown, believing the modern lacy styles to be unhealthy. Though Amos did not believe in physicians, Fannie often consulted Dr. Joseph C. Hearne, who lived just around the block from the Stillwells—so often, in fact, that many believed they were having an affair. After the murder, the predominant belief outside of official circles was that Dr. Hearne was involved in the killing. In spite of public opinion, Richard Stillwell, with his money and influence, was driving the investigation and he held to the burglary theory. Detectives focused on the African American community and the first arrests in the case, two weeks after the murder, were a black man named George Gibson and his mistress, Alice Ward. Police would not say what evidence they had but the couple was rigidly examined by two Pinkerton men. On January 28, a black man named George Dixon and his white mistress were arrested by Pinkertons for unlawful cohabitation. He was questioned about the murder because he was seen in the city that night with an unusually large amount of money. There was no evidence to hold any of these suspects and they were soon released. With a lack of useful clues to follow the Pinkertons retired from the investigation and the case turned cold. Then, the following December, almost a year to the day from the murder, Fannie Stillwell and Dr. Joseph C. Hearne were married. Interest in the case was renewed and rumors of Dr. Hearne’s involvement resurfaced. John E. Stillwell, a nephew of the murdered man, tried to force a thorough investigation by the grand jury which included Dr. Hearne, but the prosecuting attorney refused to pursue any theory but robbery. The grand jury did not return any indictments and the widow, now called Fanny Hearne, forced the retirement of John Stillwell from the pork packing company. Richard Stillwell raised the reward to $10,000, and over the next four years a few arrests briefly seemed promising, but there was no significant progress in the case. The grand jury met at least five more times and after considering the evidence handed down no indictments. The Hearnes left Hannibal and moved to San Diego, California where Dr. Hearne opened a medical practice. Then in August 1894, Fannie Hearne filed for divorce charging cruelty and failure to provide. The decision had been mutual, and Dr. Hearne did not contest the charge, though privately said the cause was incompatibility of temperament. After the divorce, Fannie returned to her previous married name of Stillwell. News of the divorce, even as far away as California raised memories of the Stillwell murder. An article in the San Francisco Chronicle connecting Dr. Hearne to the murder angered the doctor so much that he sued the paper for libel asking for $200,000 damages. In July 1895, Dr. Hearne traveled back to Hannibal along with his attorneys and attorneys for the Chronicle, to take depositions. It was not a good time for Dr. Hearne to return to Hannibal. Richard Stillwell had finally abandoned the burglar theory and had come to accept what the rest of the town had been saying since the beginning—his father was murdered by Dr. Hearne and Fannie. He had gathered evidence on his own and canceled the reward so as not to influence the trial when he took the case to court. Then he volunteered to be deposed in support of the San Francisco Chronicle. Richard Stillwell testified as to why he had changed his mind. He said that he had recently learned from several sources that Dr. Hearne and Fannie had been in love before the murder and had engaged in criminal intimacy. He learned that Dr. Hearne did not think Amos Stillwell was a fit companion for Fannie and he planned to use his influence over her to bring about a divorce. Hearne was heard to say he could hire a man to “slug” Amos for $2.50. One of Richard’s sources, Mrs. C.P. Heywood, said Hearne had told her he was at the Stillwell house when Amos was away in St. Louis. Amos returned unexpectedly and when he entered the house Hearne had been naked and did not have time to dress. Hearne hid in the shadows and Amos passed him in the hall without seeing him. Hearne told Mrs. Heywood that if he had been caught, he would have shot Amos. Everyone would think it was a burglar; no one ever suspects doctors or ministers. A few days later the grand jury reconvened and this time they heard testimony from all of the witnesses who had testified for the San Francisco Chronicle, including Richard Sitwell, who had obtained a deposition from his source Mrs. C.P. Heywood. There were other bits of incarnating evidence the jury had not heard before: Mollie Stillwell had never slept away from home before the night of the murder, witnesses who saw the body that night believed it had been moved before they arrived, several witnesses saw Fanny in a fancy modern nightgown after the murder, Jim Abbey, former detective for Missouri Pacific Railroad found a plain cotton nightgown with bloodstains on the sleeves in an outhouse vault on the Stillwell property. The grand jury indicted both Dr. Hearne and Fannie Stillwell for first-degree murder. They were arrested and held for trial. The defendants were to be tried separately; Dr. Hearne’s trial began in Bowling Green, Missouri on December 9, 1895. The people of Hannibal would finally have the justice they had craved for seven long years. But after hearing two weeks of evidence, the jury returned a verdict of not guilty. There was not enough hard evidence to tie Dr. Hearne to the murder. Dr. Hearne was immediately released from custody. Fannie Stillwell was released on $5,000 bail but Hearne’s verdict had effectively cleared her as well and she would never be tried for the murder. The trial had resolved little. Dr. Hearne and Fannie Stillwell would remain the prime suspects in popular opinion. The people of Hannibal would remain appalled that one of their most prominent residents could be murdered without retribution. Dr. Hearne continued his suit against the San Francisco Chronicle. Seven months and two trials later he won his case and was awarded $10,000 damages. “After Seven Years,” Kansas City Star, July 21, 1895. “Amid Scenes Dramatic ,” St. Louis Republic, December 22, 1895. “Convincing Proof to Him ,” Kansas City Star, December 14, 1895. “Did He Kill Stillwell?,” St. Louis Republic, January 29, 1889. “Dr Hearne at Hannibal ,” St. Louis Republic, July 6, 1895. “Dr and Mrs Hearne Indicted,” St. Louis Republic, August 18, 1895. “Dr. 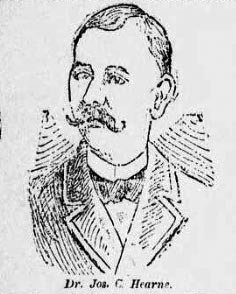 Hearne Wins Suit,” Kansas City Star, July 27, 1896. “Evidence of the State Shaken by Dr Making A Weak Case,” Kansas City Times, December 14, 1895. “Knocked out,” St. Louis Republic, November 27, 1890. “A Midnight Murder,” St. Louis Republic, December 31, 1888. 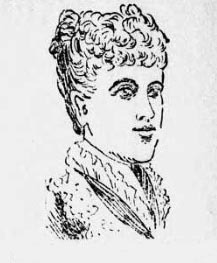 “Mrs Hearne Arrived Will Reply on the Stand to Charges Made Against Her Mrs,” St. Louis Republic, July 14, 1895. “On the Right Trail,” St. Louis Republic, January 16, 1889. “Richard H Stillwell ,” St. Louis Republic, July 12, 1895. “Romance Of A Crime Or The Mystery Of Amos Stillwell's Murder,” Kansas City Times, February 28, 1892. “The Stillwell Case,” St. Louis Republic, February 19, 1890. “The Stillwell Murder,” Augusta Chronicle, February 5, 1889. “Stillwell Murder,” Evening Bulletin, December 23, 1889. “The Stillwell Murder,” St. Louis Republic, December 1, 1890. 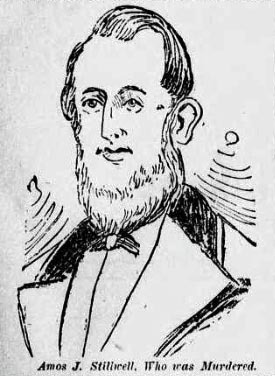 “Stillwell Slayer,” St. Louis Republic, November 25, 1890. “Their Tragic Union Ended ,” Kansas City Star, August 26, 1894. “They Were Not in it,” St. Louis Republic, November 26, 1890.